mods:extent 1 lithograph; 35.8 x 46.1 cm. mods:abstract Col. lith. 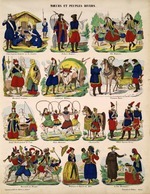 imagerie pl., 4 rows showing 13 ill. of costumes of Hungary, Armenia, Moldavia, Russia, Mexico, Persia, Haiti, incl. 2 of uniform groups. mods:note Large upright folio; margins. provenance London, Fletcher, '55. DpAs.